I'm running into an issue where i keep getting a fault code 75: Throttle plate position unable to maintain or achieve the desired target position. I've redone the TPS calibration procedure multiple times, i've replaced the throttle body with a new unit and i've switched out the accelerator pedal thinking it was that as well. This issue started happening after an alternator went out , it was replaced with a new one and that's when i've started having issues. This is mainly happening at the track. Before this weekend i replaced the throttle body with a brand new unit and i spent two 30 sessions this past weekend going around a track at slow speeds during the rain and there were no issues, no codes popped up so i thought the new throttle body fixed it. Once the track dried up i was able to go WOT and get on pace and that's when the code would start popping up and the car would go into limp mode. 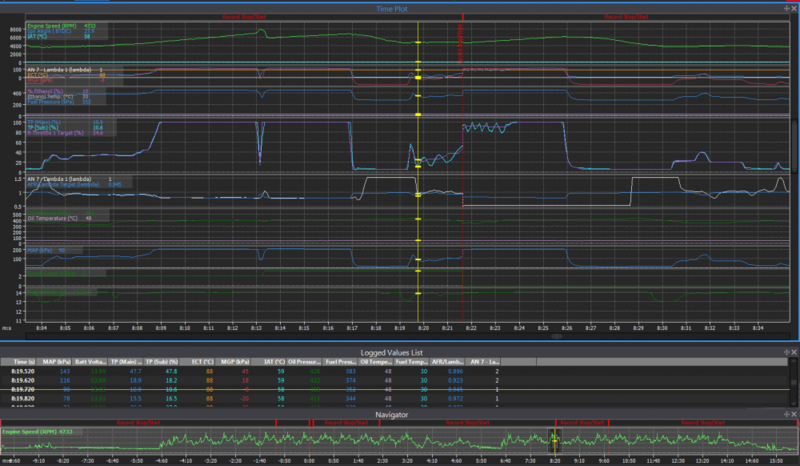 sometimes the car would go into limp mode right after turns where i'm feathering the throttle and then sometimes The fault code pops up randomly and i cant figure out why. i have data logs of the last session and the map. Unfortunately that log doesnt contain values for TP Error Accumulator or TP/Target Error Accumulator. If we cant fix it here, add these 2 into the logged parameters for next time so we have better info next time it faults. Comparing TP main & Sub we see the 2 of them track together quite nicely so its unlikely to be a TPS error. These 2 values seem to be within 0.2 - 0.3 at all times which is fine. comparing e-throttle target against TP main & Sub postitions however, we see that every time you get off the throttle, the TPS postition almost "bounces" back up a couple %. Usually this is caused by PID setting issues in the ethrottle control. in your case it looks like they might be a bit too aggressive, and its causing some pretty bad overshoot (and for it to not quite oscillate, but still jump back in the wrong direction once it overshoots). This screenshot shows the worst example I could find of both the "bounce" when you go from full throttle to 0%, and for general poor tracking of target -> actual TPS angle. Note the blue TPS line overshooting by 10% ish repeatedly between 10:04 and 10:08. There is another good example at 13:40 +/- 5 seconds. Its almost definately TP/Target error due to PID, you can see it is the first screenshot oscillating in a couple of areas. I would try dropping the P down to 8.5 and bump the D up to 40. Thank you for the input, i really appreciate it. I will add those parameters to my ecu logging and see I can replicate it on the street. Just curious are there parameters that you recommend being logged at all times for troubleshooting purposes? i know we are limited on the number when we are logging on the ECU. Thanks, i will try to replicate the issue with the current settings with the additional parameters and then try adjusting the P&D settings to see if that works. i didnt see a TP/Target Error Accumulator, that was only an option if i had a E-throttle 2 sensor which i'm only running E-throttle 1. I wasnt able to drive the car since it was boxed in the garage due to a hail storm heading our way last night. I set the e-throttle set up mode on and played with the throttle to see if i could replicated the bouncing while coming off full throttle and it didnt seem to happen. I changed the settings to p-8.5 and D=40 and it looks like it made the TP and target further off.